How convenient to die on Memorial Day weekend, when we're already getting enough pro US military propaganda. 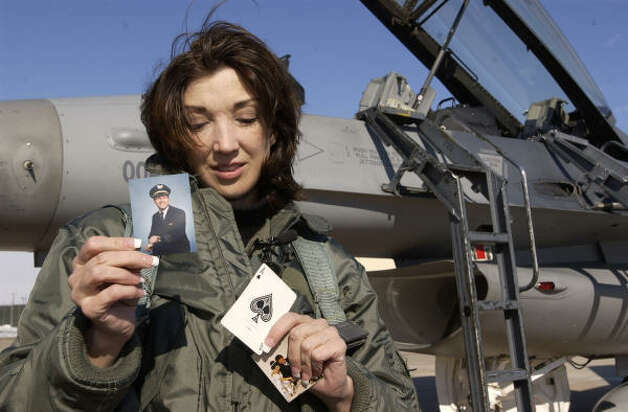 Did we ever get a story of why she's holding the death card here? Last edited by Utah on Tue Jun 05, 2012 2:27 am, edited 1 time in total. Ah yes, a lot of actors in this farce have been 'retired/reassigned' in various melodramatic ways to keep "truthers" spinning off the track. Like fake witness/agent "Kenny Johannemann" (who had apparently appeared on the Jenny Jones show as well). Just another spook actor (note mask overlay in street scene), had to 'kill' off his fake ID lol Planned years ahead, the area was cleared of all civilians beforehand: NO planes, NO victims (nor ever intended), NO "amateur" film exists (electro-jammed). Just war ratifying illusions created by a few operatives & media execs 'in the know' from an Op Comm Center. We were conned by an elaborate movie, with a cast of crappy actors to demolish some old asbestos buildings & 'justify' a profitable war. Let's not forget the untimely deaths of "Barry Jennings", whistleblower trapped in B7 (heart attack) & "Wendy Burlingame" , daughter of "Chic" , pilot of "AA77" (apartment fire). It reads like the back of a September Clues book jacket. Wow. What a great article, leading me to a conclusion I had never before considered. Obvious implications for why so many vicsim tributes read like bad novels. Which leads me to the one rule in fiction of which I am certain: Characters want things badly, and they want them now. The bully, the martyr, the lover and the thief are all driven by their desires. And, mind you, there's nothing casual in their undertakings. They connive, they spin, cajole and bargain to get what they think they've got coming. It could be love, or money, or revenge or something much more elemental. In "Les Misérables," Jean Valjean stole bread. Characters want, therefore they do; desire drives the action. It is what makes characters real, and it is the writer's job to connect the characters' wants to the reader's own longings. Like characters, readers want justice, love, redemption, freedom, connection. Desire propels. Mistakes, irrevocable blunders get made. The story quickens. But while characters want things desperately, only rarely can they have them. Drama lies in the frustration of desires. Characters in fiction are not real people, any more than dialogue is exactly how people talk. Characters are "über"; they are like bouillon before you add water. And so are their desires. The writer's art lies in creating a convincing illusion, a heightening of desire and difficulty—all for the reader's entertainment. 1) The staged vicsim tributes seem so bad because creating convincing characters and writing realistic monologues or dialogue (or tributes, in this case) is actually quite hard to do well. The team assigned to backstop these flimsy characters used established dramatic tecniques, but lacked the skills and experience to produce a product both entertaining and realistic. Hence the 'bad novel' parellel fits nicely: Hack authors trying to follow a 'proven forumla'. 2) Fake tributes were deliberately written with an emphasis on entertainment and not realism. While the tributes don't pass the smell test of a critical reader/ investigator, the average sappy American visiting tribute websites is more than willing to suspend disbelief and go along for the ride. Many such fools then contributed an authentic tribute to the imaginary victim they never knew! This crap was written for the masses, and the masses are full of suckers. 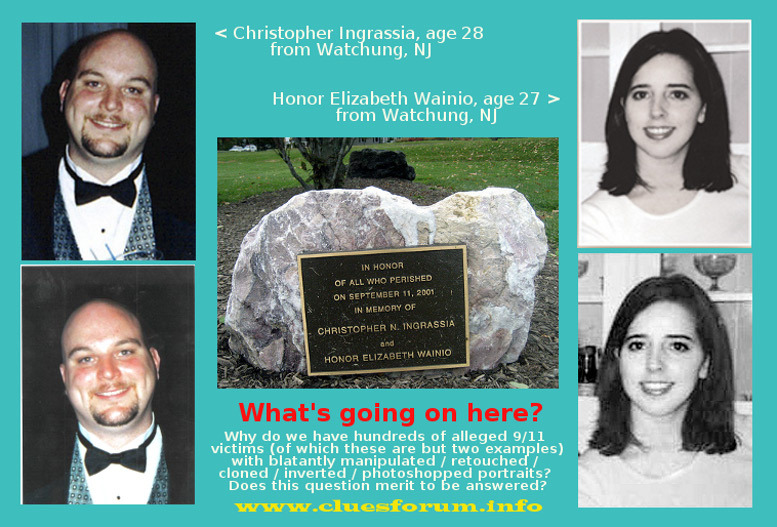 Honor Elizabeth Wainio, from Watchung, NJ, 27, allegedly died in Flight "United 93". So now we have two "9/11 victims", united by residence, age (almost), death and ... photoshopping. I would hereby like to thank Youtube user "happymealmobster" for this interesting information. Achtung Wachtung! "Ve vill conduct ze mock funerals for ze mock victims"
In which capacity did he/she attend the funeral? Is he/she a "family friend" or "relative" or actor? Invite him/her over here Simon! A copy photograph of Christopher Ingrassia a 28 year-old trader who worked at Cantor-Fitzgerald and was killed in the World Trade Center on Sept. 11. Yes Maat, I was just looking at that rather "Jayhanesque" Ingrassia! The copy bit intrigued me too!! Simmetry wireless — "Anytime, anywhere...it's a good call!" Last edited by whatsgoingon on Fri May 24, 2013 9:42 am, edited 1 time in total.